(Nanowerk News) Lower CO2 emissions demand more renewable energy in the energy system. This calls for new solutions that take account of the considerable variations in the amount of wind energy, hydropower, solar energy etc. One of the solutions is a distributed energy system. Here it must be possible to store surplus energy locally using, for example, local SPEC electrolytic cells. The foundation for this technology is being developed by the CASE research project. Today, most energy is produced at large centralised power stations based on fossil fuels such as coal, oil and natural gas. And then there is the energy produced by hydroelectric power stations, nuclear power stations and wind farms. The energy flows only one way, from the central power stations to the electricity grid and on to consumers. The idea now is that much more renewable energy should be fed into the grid. This calls for new solutions that take account of the considerable variations in the amount of wind energy, hydropower, solar energy etc. One of the solutions is a distributed energy system. A distributed energy system consists of many small, geographically dispersed production units and a few large, central units. The different parts of the transmission systems function independently of each other but can play together using IT, making it possible to utilise both central and local technologies to meet the energy needs of the moment. Locally, energy will be produced to a greater extent from local energy resources such as the sun, wind, straw etc. Locally this will entail a need to be able to transform surplus electricity from renewable sources to energy which can be stored. One of the options is to store surplus production as chemical energy. This might be in the form of compounds such as liquid methanol (CH3OH) or gasses such as natural gas (CH4) or synthesis gas (CO+H2). Once the energy has been transformed into these chemical compounds, known as synthetic fuels, it is easy to store in tanks and pressure tanks. The synthetic fuels can be used directly in cars and as starting materials for the chemical industry. There is basically nothing new in this principle. The only problem is that today’s technologies are best-suited for large-scale central plants operating at high temperatures. Therefore, it is necessary to develop new types of plants that operate at lower temperatures and are thereby suitable for installing together with local wind turbines. The objective is to realise these goals through a new research initiative, Catalysis for Sustainable Energy (CASE), which will develop catalysts to transform local renewable energy into chemical energy, for example hydrogen or methanol. CASE is headed by Professor Jens K. Nørskov from DTU Physics. Making the step from electricity to chemical energy requires an electrolytic process. Through electrolysis, water is transformed into hydrogen and oxygen (and CO2 to CO and oxygen) using electricity. The ABF (Fuels Cells and Solid State Chemistry Division) develops electrolytic cells for this purpose in the form of SOEC electrolytic cells. “An SOEC electrolytic cell is built up of ceramic materials and is, in principle, a reversed SOFC fuel cell which Risø is developing in conjunction with, among others, Topsoe Fuel Cells,” says Research Professor Mogens Mogensen from ABF (Fuels Cells and Solid State Chemistry Division). The process in the electrolytic cells corresponds in reality to part of nature’s own photosynthesis, which takes CO2 out of the air and transforms it into a store of chemical energy in the form of sugar. Electrolytic cells can therefore contribute to removing CO2 from the air. In other words, they resemble the role of forests in absorbing CO2. By transforming CO2 to liquid synthetic fuels in an electrolytic cell, our means of transport can use sustainable energy, power from wind turbines and solar cells. When a car runs on synthetic fuel, CO2 is released to the atmosphere. However, no more CO2 than has been used to produce the synthetic fuel, which in effect means that no CO2 is added to the atmosphere. High-temperature cells are very efficient compared with other electrolysis methods as they produce more oxygen and carbon monoxide from a given amount of electricity. This is because at high temperatures water and carbon dioxide can be split into synthesis gas (hydrogen + carbon monoxide) and oxygen using the heat, and the SOEC cell is thereby self-cooling: The heat which is inevitably produced when electricity runs through something – this is needed for the electrolytic process. Moreover, it is possible to utilise the heat which is often available as surplus heat from, for example, power stations and industry. “These high-temperature electrolytic cells will be good for large, central plants for manufacturing synthetic fuel from synthesis gas. The catalytic processes which follow the electrolytic process require a complete facility with a catalytic reactor coupled to an electrolytic cell plant because the synthetic hydrocarbons are not stable at such high temperatures (over 650°C). Such a facility probably needs to exceed 100 MW for it to be financially viable,” says Mogens Mogensen. In addition, you avoid heat loss in the large plants. Work has been conducted on the high-temperature cells for some time in SERC (Strategic Electrochemistry Research Center), where a number of enterprises and research centres are collaborating on the development of these types of electrolytic cells. For local production conditions, it is necessary to develop cells which can operate at temperatures in the 200-400° C range. This way, small, local electrolysis plants can be established, which can be connected directly to a local wind turbine and produce synthetic fuel for the local area. “The vision is to be able to build small, modular plants, with one standing beside each wind turbine in the local area,” says Mogens Mogensen. Figure 1: SOEC cells function according to two different principles. In one SOEC cell with a proton-conducting electrolyte, the hydrogen ions pass from the anode through the electrolyte to the cathode. These cells can operate at lower temperatures and can be used to produce different kinds of synthetic fuels. In cells with an oxide ion-conducting electrolyte, the oxygen ions (oxide ions) pass from the cathode through the electrolyte to the anode. These cells require a high operating temperature which will cause the synthetic fuels to split. This type can therefore only be used to produce synthesis gas. The figure also shows how the processes at the anode correspond to photosynthesis in nature. As we know, this process results in nature’s fuel, sugar. The lower temperature means less heat loss and makes it easier to build small and modular electrolysis plants. For this to succeed, it is necessary to develop completely new materials. These will be developed within the CASE research initiative. ABF is working with two electrolyte types. One is a mesoporous ceramic material, which can absorb liquid electrolytes in their nanopores and retain them. The second type is low-temperature proton-conducting materials (see Figure 1), which uses a solid ceramic electrolyte. It is hard and costly to directly separate CO2 from the atmosphere. Professor Mogens Mogensen therefore envisages the necessary CO2 coming from other sources. For example breweries and second-generation bioalcohol plants, where fermentation produces large volumes of CO2. Another possibility is using Denmark’s most widespread raw material, limestone (calcium carbonate). Heating limestone liberates CO2, leaving quicklime (calcium oxide). Water is mixed – or ‘slaked’ – with quicklime, producing slaked lime (calcium hydroxide), whereby most of the heat which was used is again released. It is very well known that slaked lime reabsorbs CO2 from the air relatively quickly. Slaked lime mixed with sand is called mortar, which has traditionally been used as a binding paste in masonry. The wet mortar between the bricks absorbs CO2 from the air and hardens through the formation of lime to a stone-hard substance that binds the bricks together. In other words, the lime is part of a carbon cycle. The CO2 which is released when the lime is burnt is absorbed again when the slaked lime absorbs CO2 and is thereby converted back to lime. It is precisely this cycle which can be used to manufacture synthetic CO2-neutral fuel. “You can therefore produce synthetic fuel with a clear conscience based on CO2 from lime and use it for motor transport, as the liberated CO2 is reabsorbed by the slaked lime which the CO2 originally came from,” says Mogens Mogensen. 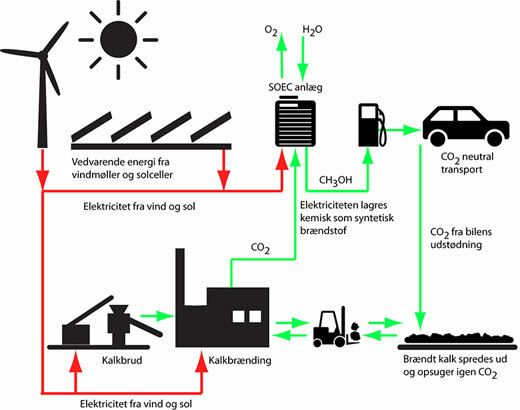 Figure 2: The figure shows how limestone from the Danish subsoil can be used to produce sustainable synthetic fuels.